In 2010, a powerful earthquake devastated Haiti, killing more than 230,000 people and injuring more than 300,000. More than 100,000 houses were destroyed and nearly 200,000 were damaged. 1.5 million people became homeless in the few minutes the quake shook the tiny Caribbean nation. Aid poured in from around the world, but Haiti had so little infrastructure left that much aid was stolen or misused. 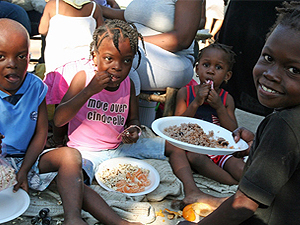 Churches and other organizations began sending groups to Haiti to help rebuild the nation while providing hope in the form of religious services. Join us as we follow one group of believers as they help the Haitians rebuild and reconnect with God. Nearly 5 years after the 7.0 magnitude earthquake struck Haiti, many people are still without homes, schools and churches. GroundSwell Pictures was formed in 2014 by award-winning Producers/Directors/Writers Jan Johnson & Pat Wright. With a goal of moving people to action through film, GroundSwell was created to engage and inspire diverse communities by producing films, teaching filmmaking, showing films and supporting filmmakers who can make a positive difference.